Thanks again to Tom for collecting these reviews! "Overall this storyline was entertaining, amusing, daft - this issue lacked the inventiveness of a 'meat suit' and the humour was maybe a little too dark - that ending was either really really dark humour or just plain bizarre. " "This isn't a groundbreaking book, but it keeps DP looking tough and lets him bounce around the Marvel U and into some unique guest stars. That's pretty much what I want from a Deadpool comic." "But as mentioned, this issue never fully takes off thanks to the relatively lackluster humor. There is funny to be had here, but Way begins to slide back into the rut of relying too much on Deadpool's dual monologue for comedy." 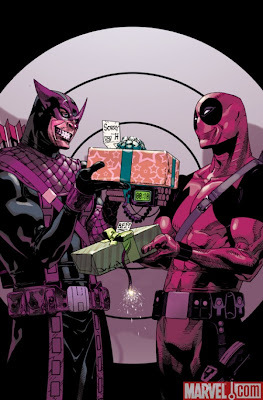 "Deadpool #12 is a great end to the Deadpool v.s. “Hawkeye” arc. Within you’ll find a really fun book that will have you pulled in until the infamous last page. After that, you’ll just find yourself scratching your head wondering what you just saw." "I never thought I would be a Deadpool fan, but this is so well written... I recommend it -- 4 out of 5." "I loved this issue, maddening though it may have been, and Paco Medina’s art has truly never looked better." "Okay, so there is no meat suit or arrow through the head, but this wrap up of the Bullseye vs Deadpool story ends as it began - quirky, funny, immediately forgettable."